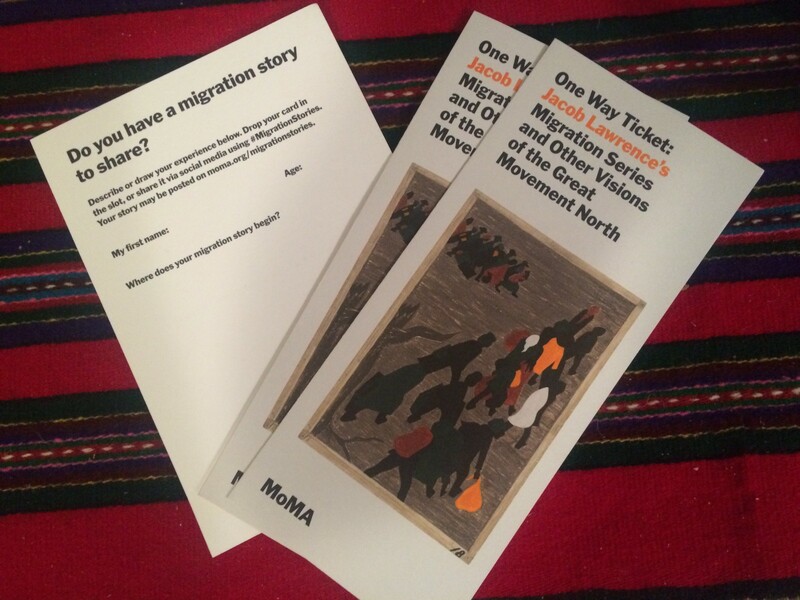 While preparing for the QCC Adult Literacy Program’s June Intensive classes, I knew I wanted to bring students to see Jacob Lawrence’s Migration Series at MoMA. Currently on exhibition in its entirety, the series has been united for the first time in twenty years. The exhibit, titled One-Way Ticket, centers around all 60 panels of Lawrence’s canonical series and highlights representations of the black experience in America in the mid-twentieth century. Examining portraiture, photography, and identity in order to learn English opens up a space to discuss students’ stories as immigrants. Having worked closely with the CALTA21 curriculum over the past few years, I saw an amazing opportunity to use the curriculum in conjunction with the Lawrence show. Examining portraiture, photography, and identity in order to learn English opens up a space to discuss students’ stories as immigrants. In the process, they are also building tools to examine the histories and journeys of others. Thus, an exploration of the Great Migration and its significance in American history fit in wonderfully with the CALTA21 curriculum, once some small adaptations were made. To prepare for the trip, we dedicated the prior class to exploring the work of Jacob Lawrence in its historical context. During a dynamic and informative guest lecture from Patricia Lannes, our students were introduced to the Lawrence series, as well as an overview of the history of Civil Rights in America, starting with the Declaration of Independence and stopping with the Voting Rights Act of 1964. Using VTS to explore some of Lawrence’s panels in the classroom allowed students to engage with this history on both a personal and interpretative level, bringing human voices back into a now distant historical moment. Students had also previously received and reviewed museum vocabulary, as a part of the CALTA21 curriculum, in order to build language to talk about art and engage with the works in a museum. Patricia’s classroom visit was a wonderful way to build the foundation for visiting the museum. Wednesday turned out to be a beautiful day and the excitement was certainly palpable once we arrived at the museum. We made our way up to the third floor and, after a brief introduction, the class began to select specific works of art to focus and examine critically, with the help of a worksheet from the CALTA21 curriculum. 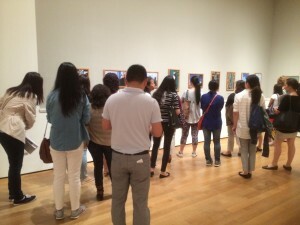 While the chaos of MoMA made it difficult for us to discuss the experience as a whole group, I was able to go around and speak with students one on one during the trip to view their work. I was struck by the deeply thoughtful questions and observations posed by our students. One student noticed a transformation from the first to the last painting; the first panel shows the backs of the figures as they move through a train station and the final panel shows them facing forward in front of the train tracks. She understood this change as symbolic of a hopeful future, as the figures look forward to a better life. I’m excited to bring these questions and observations into the classroom and I look forward to hearing what our students have to say when I see them again this week! Valerie Smosna is a Program Assistant and Instructor at the Queensborough Community College Adult Literacy Program. She worked as a Project Coordinator and Editor on CALTA21. Her background in art history and her focus on the intersection of art, social justice and underrepresented populations, has been instrumental to her work on CALTA21 and with the QCC Adult Literacy Program. She received her M.A. in art history from Bryn Mawr College and her B.A. from Haverford College.